We have tents with and without sides, tent lighting, tables and chairs. Great for church events, school functions, company picnics, etc. 20 x 40 Frame Tent - Holds 8 round tables seating 64 people. Good for any surface. 20 x 20 Frame Tent - Good for any surface, holds 4 round tables and seats 32 people. 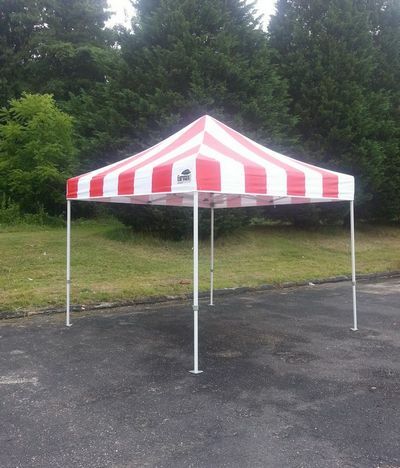 20 x 15 Frame Tent - Good for any surface, holds 3 round tables and seats 24 people. Curtains available. 10 x 10 Pop-up Tent - Good for any surface. Great to put games or drinks under. Curtains available for all pole and frame tents. Please ask if larger sized tents are needed. We have many different types of tables from rectangular, to circular, to kiddie height! We rent the chairs as well. We can cover all your event's needs from end to end! Give us a call to see how we can customize a package to fit your event's needs. Don't Forget Portable Restroom Trailers!